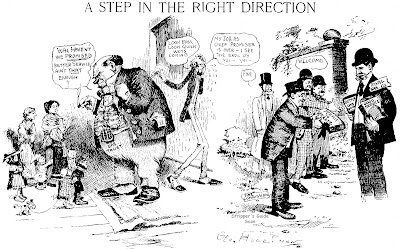 Herriman Saturday rolls around once again, and our first entry is from November 24 1906. This cartoon illustrates a news story about some LA aristocrat type whose bulldog liked to bite people. Despite packing a court with his high muckety-muck friends the judge nevertheless sentences the dog to wear a muzzle. 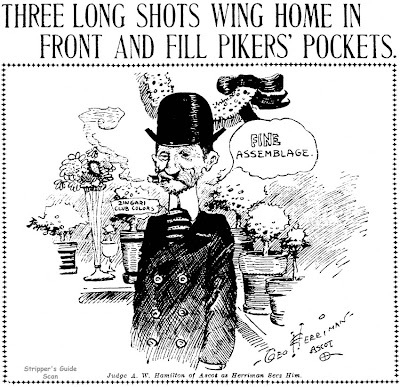 Herriman then goes on vacation until December 1, with a Thanksgiving cartoon appearing on November 29th that he probably completed in advance. 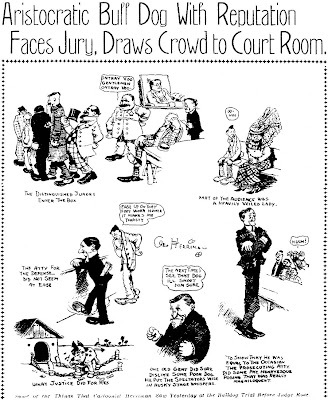 On December 1 Garge returns with a pair of cartoons, the first a portrait of one Judge Hamilton who, based on a little Googling, seems to have been in charge of the horse track at Ascot. 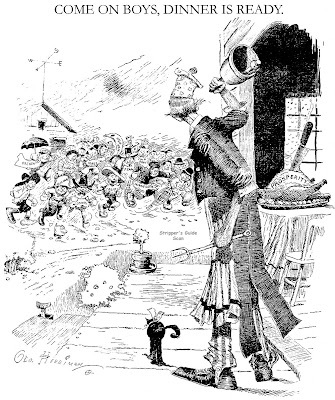 The second, an editorial page cartoon, apparently heralds the entry of a rival gas company into the Los Angeles market. Good news for LA given the cartoon we printed last week. Herriman fans be sure to check back in on Christmas Day if you have a moment -- a special treat will greet you. Please excuse the next to last strip. The KC Star had a little technical SNAFU on that one, cutting off the tail end of the last panel. You post strips #1-21 and tomorrow is Herriman Day. Will we get strips #22-26? And a Royal King Cole bio? #21 is the last strip of this series, so Herriman Saturday goes on as normal. And I'd love to write a King Cole bio but I know nothing about the guy except for his list of credits. Anyone out there have some inside dope on Cole? 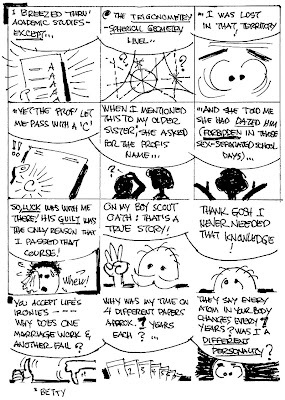 Eagle-eyed readers may notice that the copyright notices are missing from the strips. This isn't my doing. The Kansas City Star, which is the origin of my tearsheet run of this strip, made it a policy to remove all syndicate stamps from their strips. Hello,Allan------Just why do you suppose some papers decided to chisel out the syndicate copyrights? The Philadelphia Inquirer also did this for many years. (Dramatically abusive, they also shrank, re-arranged, and only fully colored precious ads.) -----King Cole Johnson. I've always assumed that copyright removal was a rather absurd attempt to give readers the impression that all this stuff was produced by their local paper (remember the Omaha Bee, where every strip had a creator byline that read "Drawn for the Bee by "insert name"?). There are also those annoying papers that remove all the dates from their strips. Sometimes this was done for a somewhat decent reason -- they were running stuff late and didn't want to broadcast the fact -- but I think others did it because they felt the dates were a matter for internal record-keeping and should be removed so as not to mar the pristine beauty of the art (oh, except that for that big unexplained hole where it got scratched off). Starting another Christmas strip today, this one is from 1935 and titled Christmas in Toyland. This was a King Features strip and featured art by Royal King Cole and story by Brandon Walsh. I think you'll find this one has quite a different tone than Santa's Secrets, it's quite witty and more than a bit goofy. Just for laughs, I was wondering if Ivey, during his days on the Examiner in S.F., ever encountered the immortal Lucius Beebe, who I believe during that time was toiling for the rival Chronicle. I have a collection of Beebe's material he did for the Chronicle, and he surely seems like someone that a man of Ivey's eye couldn't possibly miss. "Lucius Beebe didn't frequent bars popular with the Examiner crowd. Beebe was a dandy and he dressed as such (the opposite of the famous 'Emperor of San Francisco' with his mutt dogs) and I never had the experience of making his acquaintance, sadly. My time on the Examiner was 1959-66, sort of the beatniks into the hippies era, though I was not part of that scene. For some strange reason their poets came to visit me in my office. Gary Snyder and another whose name I've forgotten would show up and start chatting as I inked my cartoon. What the attraction was I was unaware of, as I was just drawing away and listening. Pleasant chaps, not cartoonish. I only knew of Lucius Beebe through news articles and columnist items."